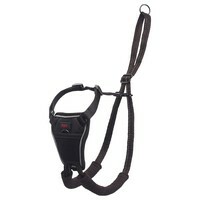 Halti No Pull Dog Harness is simple to fit and very easy to use. The elastic webbing and mesh that cover the dog's chest allows freedom of movement, whilst the padded "Sherpa Sleeves" eliminate rubbing and provide additional comfort. The No Pull Harness design uses the 'squeeze and lift' theory that tightens on the dog when they pull on the lead; returning your dog to a normal controlled walk and deterring them from pulling. To ensure an accurate fit, measure carefully around the base of your dog's neck (where the collar would naturally sit). I bought this harness as my 6 month old miniature schnauzer has resisted all attempts to train him not to pull. I chose it as it seemed to have a lot of good reviews on the web, testifying to it's effectiveness. Unfortunately it has made no difference whatsoever to my dog's pulling. I have also noticed that after a week's use the fabric has started to fray where it slides through the metal piece, so I can't even get use out of it as a general harness. Very disappointed and can't really say anything good about it. I have two cocker spaniels that when walked together I have a problem with one of mine pulling she is very strong on the lead. After just 10 minutes on the harness I couldn't believe it NO pulling on the lead. It is so easy to put on I would recommend this to anybody who has a dog that pulls on the lead. This is the easiest harness to put on that I have come across - usually I get muddled up with all the different clips/fasteners etc and give up using them. This harness has no buckles, just a sliding cord which tightens the harness up when you have it in place and I think it must be very comfortable for the dog, especially with the fleece sleeves. On the down side it hasn't really made any difference to my 6 month old Lhasa's pulling, which is meant to be it's big selling point. For this reason I don't feel able to give it more than 3 stars. I have a Dalmatian and a Beagle who when walked together pull and compete with each other! The harness has worked wonders and it is a pleasure to walk them both now.Easy to fit and comfortable for them to wear.